BELFAST — So far, 2015 has hardly been a vintage summer in Northern Ireland — and not just on account of the unseasonably cold weather. In recent weeks this small corner of the United Kingdom has witnessed clashes between police and pro-union marching bands, and ongoing attacks against security forces by Irish republicans opposed to the peace process. Now the murder of a former IRA man, ostensibly by his onetime comrades, threatens to collapse Northern Ireland’s power-sharing government. Northern Irish police have said that they believe members of the Provisional IRA were responsible for the killing of Kevin McGuigan in East Belfast earlier this month. The IRA was supposed to have “left the stage” 10 years ago when its weapons arsenal was decommissioned. Northern Irish First Minister and Democratic Unionist Party leader Peter Robinson says Sinn Féin, the political voice of Irish republicanism, must be excluded from the power-sharing government at Stormont if IRA involvement in the murder is proven. On August 26, the smaller Ulster Unionist party announced that they would be resigning from the Executive. British Secretary of State Theresa Villiers has been more circumspect, commenting that the continuing existence of the IRA “didn’t come as much of a surprise,” but that there was no evidence that the organization was involved in paramilitary activity. The current crisis is the latest in a long line of disputes between Irish nationalists and pro-U.K. unionists in the devolved government that was set-up in Northern Ireland in the wake of the Good Friday Agreement in 1998. That deal brought an end to the 30-year-long “Troubles” that cost more than 3,000 lives. The once quotidian violence is gone, but this remains a deeply divided society. Belfast is among the most segregated cities in the world. Across the city, rival union flags and Irish tricolors denote separate Protestant and Catholic neighborhoods. The state of play in government is little different. Even before the McGuigan killing — believed to have been carried out in retaliation for the murder of another former IRA member in Belfast earlier this summer — nationalists and unionists were at loggerheads over proposed welfare cuts for the population of just under two million mandated by the British government in Westminster. Sinn Fein says reductions in welfare payments would hurt the most vulnerable. Both major unionist parties, the Democratic Unionists (DUP) and the Ulster Unionists, warn that failure to do a deal would leave a £600 million (€825 million) hole in the Belfast Parliament’s budget. Northern Ireland receives an annual subvention of around £12 billion (€16.5 billion) from the U.K. Exchequer. Earlier this summer, First Minister Robinson insisted that if no deal is struck on spending cuts he would ask the secretary of state to repatriate control of welfare policy back to Westminster. Such a move would probably lead to the collapse of Northern Ireland’s power-sharing administration — if it has not been toppled already by the aftershock of the McGuigan killing. And yet, Belfast does not feel like a city that could soon be without a government. Tourists throng the streets, despite the summer showers. The colorful rainbow flags festooned outside bars and clubs ahead of the recent gay pride festival attest to changing attitudes in the once puritan Northern Irish capital. “I walk around this town and people aren’t saying to me ‘the union is in danger.’ Nobody. 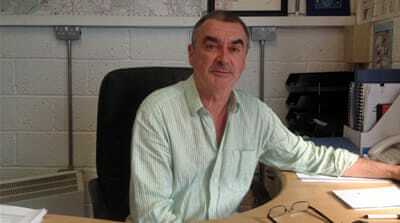 People are more interested in jobs and health,” says Alex Kane, a unionist political commentator based in Belfast. This July marked the 10th anniversary of arguably the most important step in Northern Ireland’s road to peace — the decommissioning of the Provisional IRA’s huge stockpile of weapons. The republicans’ long campaign, which cost more than 1,800 lives, was supposedly over. The cessation of widespread violence has not, however, meant the end of hostilities between nationalists and unionists. In Northern Ireland, von Clausewitz’s famous maxim is turned on its head: here, politics is war by other means. Clashes over putatively minor issues such as the Irish language provision and the routes for pro-union Orange Order parades are common. “The Good Friday Agreement managed the end of the conflict. It didn’t give us a blueprint for normal politics,” says Jonny Byrne, lecturer in criminology at the University of Ulster. The past remains deeply contested by all sides. Politicians “have never resolved the fundamentals of the conflict,” says Byrne. Northern Irish politics is characterized by “an inability to accept losses and gains through normal political mechanics.” Instead politicians of all stripes blame the British or Irish governments for failing to provide resources or solutions to local problems. The drive for consensus in the peace process also begot a system prone to cronyism. Police are investigating claims that a Belfast law firm held £7 million (€9.6 million) in an offshore bank account for a local politician in a major property sale. Northern Irish politics is still dominated by many of the same actors that trod the boards during the Troubles. Peter Robinson was elected DUP deputy leader in 1980. Five U.K. prime ministers have held office since Gerry Adams became Sinn Féin president. While old stagers dominate party politics, on the street tensions have ratcheted up. Alongside the union flags, paramilitary standards flutter in the breeze in many loyalist parts of Belfast. Illegal outfits such as the Ulster Defence Association and the Ulster Volunteer Force have been accused of recruiting new members. Earlier this summer a new loyalist terror group announced its presence. On the other side of the sectarian divide, republican paramilitaries provided a “guard of honor” at a recent funeral in Derry. 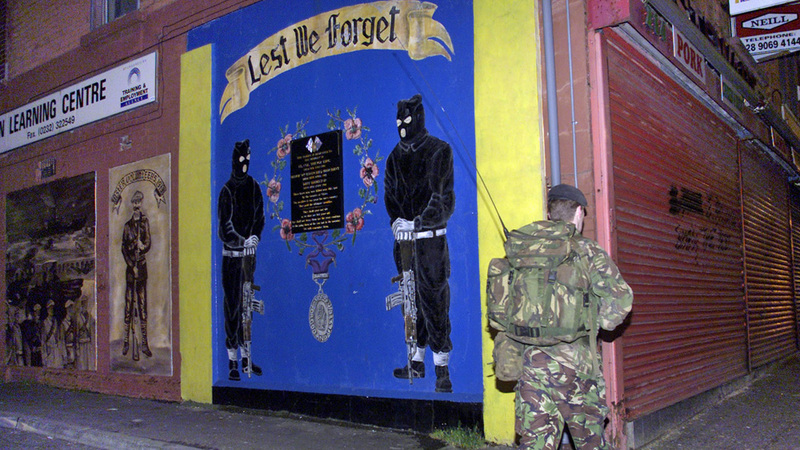 Claims of IRA involvement in the McGuigan killing have focused attention on the continuing existence of paramilitaries in Northern Ireland. “Paramilitaries are still active in the community,” says Phil Hamilton, a community worker in Rathcoole, a huge Belfast housing estate where loyalist gunmen still look down menacingly from gable end murals. “A return to the conflict isn’t on the radar but other people are filling the political vacuum,” says John Loughran, a Sinn Féin member who works with former prisoners from both sides of the conflict in North Belfast. The area is among the most economically deprived in the whole of the U.K. Gridlock in Stormont is fuelling a wider sense of disillusionment with politics. In May’s general election, Northern Ireland registered the lowest turnout in the U.K. I meet Hamilton in a bright, airy shopping arcade in Belfast city center. The building was opened by then British Secretary of State Patrick Mayhew in 1992, an early sign of growing confidence that peace was finally coming to restive Northern Ireland. More than 20 years later there is no sign of a return to the violence of the past. But even if Stormont survives the latest emergency, executive paralysis is eroding faith in the political process, warns Hamilton. Belfast, Northern Ireland – Political allegiances are hard to miss on the Shankill Road, a short drive from Belfast’s city centre. Red, white, and blue bunting and union flags line the street. Shoppers pass a peeling mural depicting a pair of men holding rifles. Their blackened, hooded heads are bowed in honour of slain members of the Ulster Volunteer Force, a notorious Protestant armed group. Northern Ireland’s 30-year-long “Troubles” ended with a peace agreement in 1998, but on the Shankill Road the scars of violence remain. Corrugated iron “peace walls”, up to eight-metres high, separate residents from nearby Catholics. The area is among the most deprived in the whole of the United Kingdom. Now Shankill Road, and the rest of this country of more than 1.5 million people, is bracing itself for further economic woes amid a deepening impasse over proposed welfare reforms, which some fear could bring down the devolved power-sharing Stormont assembly in Belfast. Northern Ireland’s rival nationalist and unionist blocs are divided over hundreds of millions of pounds worth of budget cuts, mandated by the UK government in Westminster. On Tuesday, cross-party talks in Belfast aimed at preventing the collapse of the power-sharing executive failed to resolve a standoff over welfare cuts. Unless a deal is found soon, Northern Ireland faces the prospect of bankruptcy. “Welfare reform is a huge issue right across Northern Ireland, it cuts across social boundaries,” says Winston Irvine, a community worker on the Shankill Road and a spokesman for the loyalist Progressive Unionist Party (PUP). “We are talking about a £600 million [$922m] black-hole in the Northern Ireland budget that has huge ramifications for people who are already struggling with huge inequalities,” Irvine says. The nationalist SDLP and Sinn Fein, the political voice of the Irish Republican Army during the conflict, oppose spending reductions, which they say would hurt the most vulnerable in society. Both major unionist parties, the Democratic Unionists and the Ulster Unionists, have warned that cuts are inevitable. “The current crisis has come about solely through the actions of the British government, it could only be resolved by the actions of the British government,” Sinn Fein Deputy First Minister Martin McGuinness said recently. Democratic Unionist leader and Northern Irish First Minister Peter Robinson has insisted if no deal is struck he will ask the UK secretary of state to repatriate control of welfare policy back to Westminster. Such a move could destabilise the power-sharing government in Belfast. “The crisis around welfare and the economy has tested even the most stable of states. Here it is tearing us apart,” says Duncan Morrow, professor of politics at the University of Ulster. Welfare reform is particularly sensitive for Sinn Fein, which is wary of damaging its standing in the Irish republic, where the party is riding high in polls on a platform opposed to spending cuts. “Sinn Fein want to be the peace party and the anti-austerity party, but those things are moving apart in the north,” says Morrow. The current crisis is a reflection of the continuing dominance of constitutional politics in Northern Ireland more than a decade-and-a-half on from the end of the Troubles, says John McCallister, an independent unionist member of the Stormont assembly. “We live in this bubble, a policy-vacuum bubble with no ideas. Our only policy is ‘the Brits ought to send more money’,” says McCallister. Ahead of the recent UK general election, both Sinn Fein and the Democratic Unionists called for significant increases in government spending in the region. Northern Ireland’s power-sharing arrangements require both nationalists and unionists hold power in government. With no formal opposition and little threat of losing support to parties on the opposite side of the sectarian divide, politicians often have little to gain by reaching effective compromises on big issues. Certainly traces of the dark days of the Troubles remain. 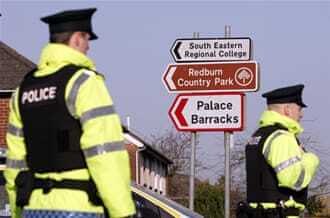 Paramilitary groups are still active in many parts of Northern Ireland. In working-class urban communities so-called “punishment beatings” are all too frequent. Intimidation and forced evictions are common, particularly in loyalist areas of Belfast. 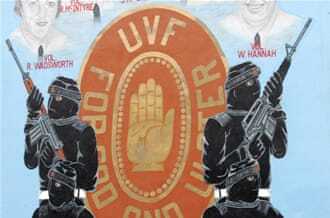 “The question nobody is asking is 20 years after the ceasefires, why are the UVF [Ulster Volunteer Force] and the UDA [Ulster Defence Association] still there? What is their role?” says Neil Jarman, director of the Institute for Conflict Research, in Belfast. Political life in Northern Ireland remains framed by the Troubles. Almost every senior figure at Stormont was involved in party politics during the conflict. There have been few new faces on government benches, particularly on the nationalist side. Signs are emerging that the electorate is tiring of this staid status quo. At just 58 percent, turnout in Northern Ireland was the lowest of the four UK nations in last month’s general election. There were few major surprises, but Sinn Fein did see its vote fall slightly, losing a seat in Fermanagh/South Tyrone. In the republicans’ West Belfast stronghold, a left-wing candidate took almost one-fifth of the vote. Despite losing its sole seat, the avowedly cross-community Alliance Party polled a record high in east Belfast. Northern Ireland is increasingly Janus-faced. The paramilitary insignia and national flags are unlikely to be taken down on Shankill Road and its republican equivalent across the peace line any time soon. But a kilometre or so away in Belfast city centre, young people mix freely without any talk of religion or politics. Is Northern Ireland’s peace on the rocks? Belfast – On Sunday morning, prominent Irish politician Gerry Adams woke alone in a cell in Antrim police station. By the following evening, the Sinn Fein president was stepping onto a podium at an election rally at the Devenish Centre, West Belfast as an 800-strong crowd chanted his name. Adams, who smiled widely, did not look like a man who had spent four nights in police custody. He told cheering supporters that his arrest in connection with the 1972 killing of West Belfast mother of ten Jean McConville was “a sham”, but that Sinn Fein would not be diverted from “the job of building the peace”. The Good Friday Agreement, signed in 1998, ended the 30-year “Troubles” that cost over 3,000 lives. Since 2007, Sinn Fein, the political wing of the Irish Republican Army (IRA), has shared power with the Democratic Unionist Party in a devolved parliament in Belfast. Concerns, however, are being raised about the fragility of the peace in Northern Ireland. The murals and flags that line many streets across this country of just 1.8 million attest to on-going tensions between unionists, who favour a political union between Northern Ireland and the Great Britain, and republicans, who want a united Ireland. Recent months have been particularly difficult. Attacks by republicans opposed to the peace process have been frequent. Early in the New Year, talks in Belfast brokered by US diplomat Richard Haass to resolve issues of the past, parading, and symbols collapsed without a deal. In February, the devolved power-sharing government stood on the brink of collapse after the revelation that almost 200 republican paramilitaries wanted for crimes committed during the conflict had mistakenly been issued with letters informing them that they were not being sought by UK authorities. In the past there were periods of calmness, now there is no time for recovery… It’s like the early signs of Vesuvius, we know the volcano is going to erupt. An indication of the on-going friction in Northern Ireland came in December 2012. After a vote at Belfast city council to fly the Union flag on designated days rather than all year round, riots broke out in pro-union areas. As streets across the city were blockaded, Belfast effectively came to a standstill. One of the reasons loyalists, who support the maintenance of the union with Great Britain, are so angry is that they feel they have lost out to republicans in the peace process, says Mark Vinton, a member of the Progressive Unionist Party, which is linked to the paramilitary Ulster Volunteer Force. Vinton feels that the peace agreement has allowed republicans to further their political goal of Irish unification. Since 1998, Sinn Fein has become the largest nationalist party in Northern Ireland and is growing in popularity south of the border. “Sinn Fein and republicanism have used the Agreement as a stepping-stone to further their own aims. So basically anybody that you speak to within a working class Unionist or loyalist community will feel massively let down, that it wasn’t an agreement at all, that there were shafted,” says Vinton. Loyalists such as Mark Vinton say their communities have never received the much-vaunted “peace dividend” promised by politicians after the 1998 agreement that ushered in the historic power sharing arrangement between Catholics and Protestants. 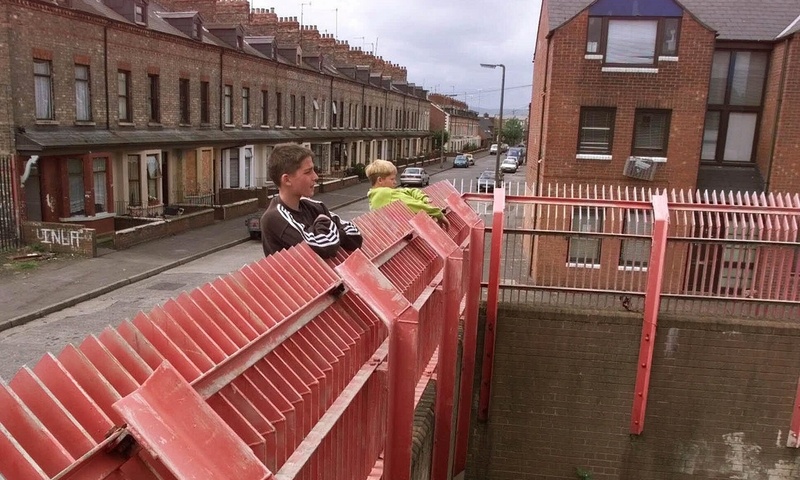 Ardoyne, a republican area in North Belfast, regularly ranks as one of the most deprived communities in Northern Ireland. Political tensions here have risen in recent months. Just across the “interface” that separates Catholics from Protestants, a loyalist protest has been ongoing since July, when a parade by the Protestant Orange Order was prevented from passing through a nearby nationalist area. 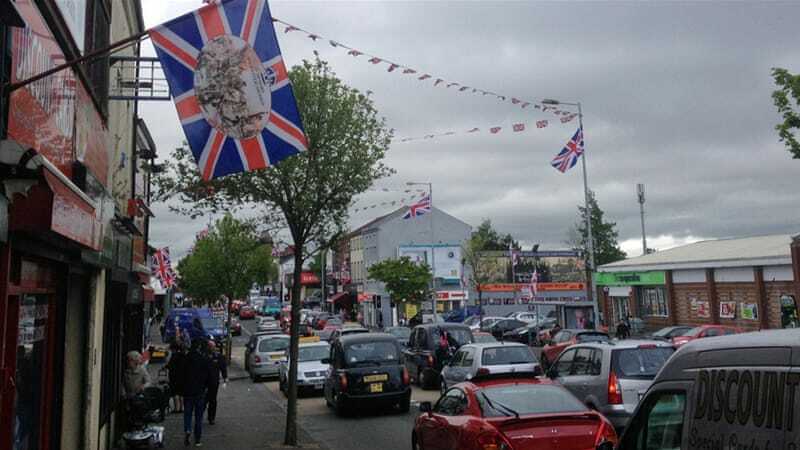 “Negative elements” are trying to manipulate and exploit tensions over flags and other symbols of identity, says Joe Marlay, a community worker in Ardoyne. Nevertheless, fears are growing that demographic and social changes could put further pressure on the gains of peace. The 2012 census found that, for the first time, Protestants do not constitute a majority in Northern Ireland. Formal education is sorely lacking in working-class Protestant areas, and the local economy is still struggling to recover from the global financial crisis. Relations between Sinn Fein and the Democratic Unionist Party, who share power in the devolved assembly at Stormont, are icy and getting colder with each passing week. “The principles, the goodwill and ethos of the Good Friday Agreement are gone,” says Dr Jonny Byrne. The Conservative-led coalition government in London has shown little appetite for involving itself in Northern Irish affairs. Prime Minister David Cameron is from a generation of Tories that have little psychological or emotional attachment to a peace process that was the product of Tony Blair and New Labour. The failure of the British government – and its Irish counterpart – to engage with the situation in Northern Ireland is creating a power vacuum, says Steven McCaffery, editor of Belfast-based investigative website the Detail. With a divided leadership in power at Stormont and growing tensions on the ground, any agreement on the past is likely to remain elusive. This makes the task of creating a shared future after conflict even more difficult. “We don’t have an agreed narrative of the past from which to try to build an agreed vision of the future,” says Norman Hamilton, former moderator of the Presbyterian Church, which campaigned for decades for an end to the sectarian conflict. Belfast, Northern Ireland – Seomra ranga – “classroom”, in Ireland’s indigenous language – reads a cardboard sign tacked onto a door. A little further down the hall, a leabharlann is filled with books. It is a very Irish scene, but in a very unlikely place: East Belfast Mission on Newtownards Road. But this might be about to change. The Turas Centre in the East Belfast Mission – turas means “journey” in Irish Gaelic – hosts 10 Irish-language classes a week. About 90 percent of those filing in and out of theseomra ranga and reading textbooks in the leabherlann are Protestant. “The Irish language is part of our culture. It belongs to everyone,” said Linda Ervine, an Irish language development officer at the East Belfast Mission. Linda Ervine’s soft voice and gentle manner bely a formidable passion for the Irish language – and for why Northern Ireland’s Protestant community should take it up. Ervine’s own turas to Irish began three years ago, when the women’s group she was part of at the East Belfast Mission took a starter course in the language. She was bitten by the bug and soon enrolled in an intensive course at an Irish centre in a nearby nationalist area. Since then, Ervine has been travelling across Northern Ireland giving presentations and talks about the history of Protestantism and the Irish language. “We discovered that in the 1901 and 1911 census, people listed themselves as having Irish here in East Belfast,” she said. In the early 1990s, not far from where the Turas Centre sits today, the loyalist Ulster Volunteer Force – responsible for hundreds of killings during the 30-year-long “Troubles“ – painted a mural on Newtownards Road celebrating the Irish mythological hero Cuchulainn as a defender of Ulster. The Red Hand Commando, a splinter group of the Ulster Volunteer Force, had “Lamh Dearg Abu” (Victory to the Red Hand) as its motto. But many unionists have not been sympathetic to Ervine’s efforts to encourage Protestants to embrace Irish. At a meeting of Down District Council in March, three Ulster Unionist Party (UUP) councillors walked out just minutes before she was due to give a presentation. UUP councillor Walter Lyons said the party “had to make a stand” because the Irish language was being “forced upon” unionists and “used against us”. Earlier this year, George Chittick, Belfast County Grand Master of the Orange Order, an influential Protestant organisation, issued a “word of warning to Protestants who go learn Irish”. He later said his remarks were aimed at Protestants seeking funding for Irish-language projects – a thinly veiled attack on the Turas Centre. The Orange Order’s criticism was “very sad”, said Ervine. In January, the Council of Europe criticised what it called Stormont’s “hostile” attitude towards Irish. Earlier this month, Irish language speakers marched in Belfast in protest over what they described as Stormont’s “failure” to protect the language. 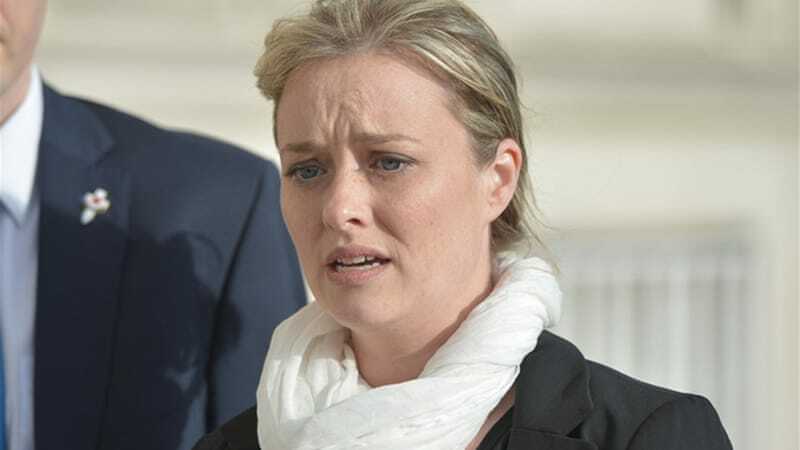 “The ongoing failure to protect and promote the language in the courts, in public signage and in the education sector continues to unravel the promises made in the Good Friday Agreement,” said Conradh na Gaeilge (The Gaelic League) in a statement. “As we speak, a group from the Shankill [a nearby majority Protestant area] are doing an Irish-language course upstairs,” she told Al Jazeera. Irish took off in West Belfast in the late 1960s, when a group of Irish-speaking families set up an urban Gaeltacht, the name given to an Irish-speaking area. In 1971, a school called Bunscoil Phobal Feirste began with nine children. 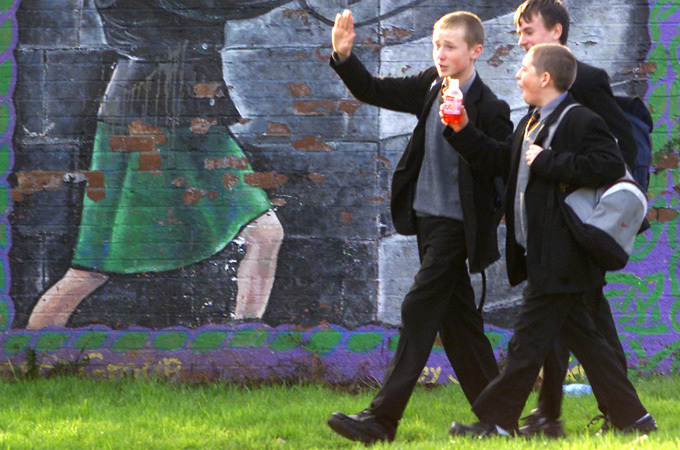 Nowthere are 12 Irish-language primary schools in Belfast. Colaiste Feirste, a nearby secondary school, has nearly 600 pupils, and St Mary’s College provides teacher training in Irish. Two of Belfast’s last three Lord Mayors – including the incumbent Mairtin O Muilleoir – have been associated with the West Belfast Gaeltacht. Back in East Belfast, Ervine argued that Northern Ireland’s rich linguistic diversity should be cherished as an opportunity to bring people together, not push them apart. “As people in Northern Ireland, when we open our mouths we speak beautiful constructions of English, Scots, Scots Gaelic and Irish Gaelic. We are using all those words, all that syntax, because we as a people bring all that together,” Ervine said. The failure of the British government – and its Irish counterpart – to engage with the situation in Northern Ireland is creating a power vacuum, says Steven McCaffery, editor of Belfast-based investigative websitethe Detail. This piece originally appeared on Al Jazeera English. But this might be about to change. The Turas Centre in the East Belfast Mission – turas means “journey” in Irish Gaelic – hosts 10 Irish-language classes a week. About 90 percent of those filing in and out of the seomra ranga and reading textbooks in the leabherlann are Protestant.